I am so, so lucky to have known Ursula Le Guin at all, let alone to have had that brief time take place at Flight of the Mind writing workshops, where she taught, talked, argued, drummed (on the night of the summer solstice, no less) and listened deeply to every woman reading their work in front of the big stone fireplace. Maybe it’s the deep green leaves along the McKenzie River in Oregon but, in my mind’s eye, I see her standing under trees. Well, she was like a great big tree. She was THERE. 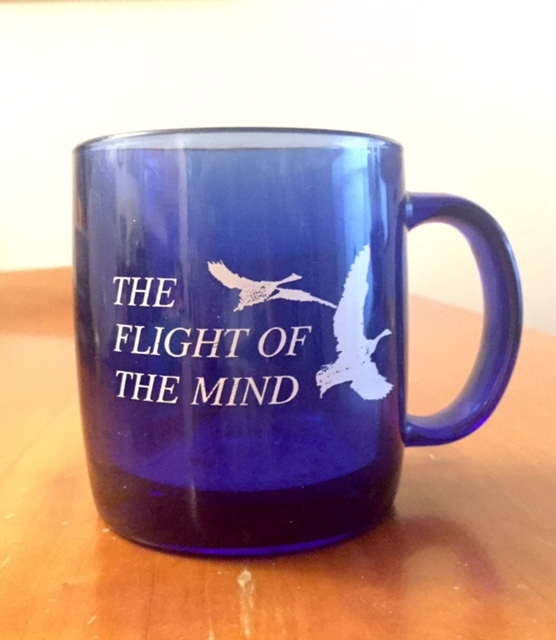 A beautiful translucent blue glass mug that says, “Flight Of The Mind” with two birds in flight. A tangible reminder of a women’s writing community Ursula Le Guin helped build. I have a memory that I almost didn’t include here because it seemed so small. But I realized it wasn’t small to me. I’ve kept it for 20 years. I had mentioned to Ursula that I couldn’t figure out what it was I was working on but I didn’t think of it as science fiction — like her work. That got me The Eye and a peppery remark that she didn’t like labels. I was writing? Good. Keep doing it. After I read the I-don’t-know-what-this story in the evening to our little community, Ursula rushed up to me, took me by the shoulders and said, “No, you don’t write science fiction! You write Ingrid fiction! That’s MUCH stranger!” I think she blew my hair back like a fierce but friendly wind. Who helped grow my strangeness, welcomed me into The Land of Odd? I’m grateful to say: Ursula Le Guin. Their flowering quince is a delicate tree and lives alone as all trees do or seem to. It is time that brings a tree to the others. It happens underneath and overhead, water and light wake leaves again and again to color and begin the bending, the bowing, to the others still at a distance but coming closer as the years pass; deeper roots find common water and the branches, of whatever sort, pass the time with their leaves breathing, gossiping, nudging, colliding, sometimes crowding those within their reach — the smaller, the weaker, which every tree has been and will be again — but just as often standing shelter, giving refuge because it needs refuge before the inevitable fall to the dry, the deluge, the storm. A truly brave author and an amazing human being. She will be missed. Can I ask, how did you know her? She was a workshop leader at a women’s (feminist) writing retreat called Flight of the Mind in Oregon that was founded and run for almost 20 years by Judith Barrington and Ruth Gundle. She was an excellent teacher and a lively, peppery person to talk to. This was all back in the 90s, mind you. Oh, ok! I read that, but wasn’t quite sure what it meant. Sounds like a great writing retreat. Thanks for the article.